Fish pie is a pub classic here in the UK. 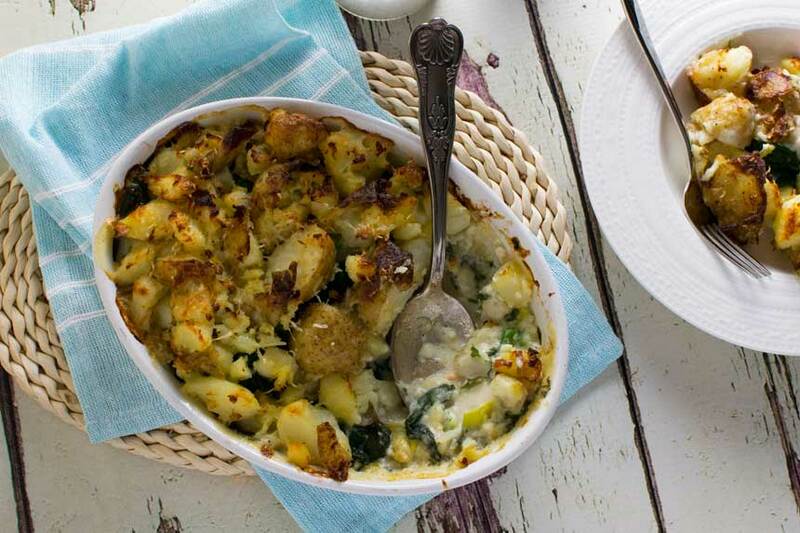 This version is a slight twist on the usual with a delicious (and easy) crispy, cheesy crushed potato topping. I have no idea how much of ‘a thing’ fish pie is in your country, but here in the UK it’s pretty big business. Go to any so-called ‘gastro-pub’ (in other words, a pub that serves food) and there’s a good chance you’ll find a fish pie on the menu. And I don’t mean pastry filled with fish. I’d say a classic British fish pie is more like the fish equivalent of a cottage or shepherd’s pie. Think a creamy white sauce with big chunks of fish in it, and possibly a few veggies, all topped with mashed potatoes, plus cheese if you like. It’s seriously scrummy, and a perfect winter warmer. It’s one of those classic dishes that every serious British chef has their own version of. I usually turn to Jamie Oliver when looking for a really good classic version of something, and indeed for my take on a fish pie I did turn to him for a few little tips. But my main inspiration for this was a recipe from Mary Berry Cooks the Perfect Step-by-step. I’ve used Mary Berry recipes here for inspiration before, because honestly, she rocks. What particular drew my attention to her fish pie recipe though was the crispy small potato top she chose over a traditional mashed potato one. Mmmm… just look at that crispy, cheesy crushed potato topping!! 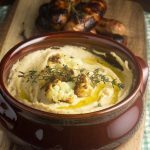 How do you make fish pie? A traditional fish pie is actually really easy to make. All you do is make a white sauce, stir in your choice of fish, then pour into a dish. Top with mashed potato and bake. Except I decided to make my fish pie even easier by adding a crispy cheesy potato topping instead of mashed potatoes. It’s just slightly easier, and of course anything ‘easier’ and ‘crispy’ gets bonus points around here! Usually UK fish pies have a few prawns in them, but Mr. Scrummy is allergic to shellfish. So while traditional fish pies tend to contain a mixture of fish and shellfish, I just stuck to chunks of plain white fish fillet and salmon. I skipped prawns or smoked fish, which Mr. Scrummy also turns his nose up at! 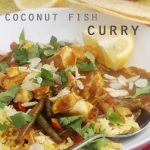 Of course though if you love prawns you can add a few of those (remember to add them raw as they cook in no time, as I’m sure you know!). For extra oomph, add a bit of smoked fish too. It’s true that fish can be expensive – at least here in the UK. But on the other hand a little goes quite a long way, as this pie is quite big, serving at least 6. Also, you can make it a bit more economical by replacing a bit of the fish with some hard-boiled eggs. It might sound weird, but trust me, it works really well. Either that or you can pray that you luck out like I did. There was no price on the packs of fish I picked up the last time I made this, so I got them for free. Bonus!! So tell me – I’m interested. 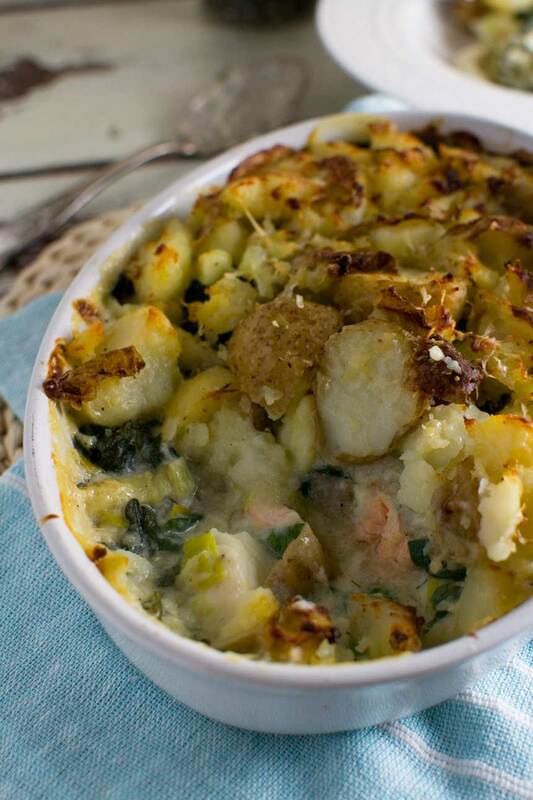 Is a fish pie similar to this something you’d find on a menu where you live? If not, why not give this recipe a go? 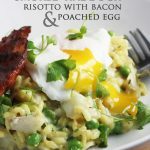 It’s perhaps something just a little bit different from what you usually make, but it’s really easy, and usually a real crowd pleaser too. 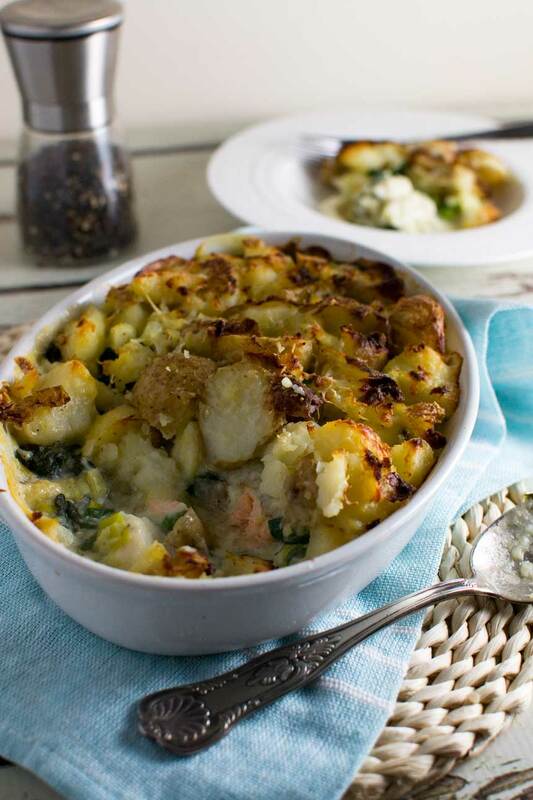 A creamy and delicious fish pie with a crispy, cheesy crushed potato topping. Mmmmm! 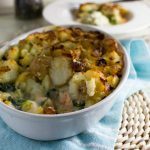 Dear Helen, I love this recipe; I was searching for something new to do with salmon and I was watching the show of Mary Berry and was thinking of fish pie (no, unfortunately it’s not so popular in Holland:-(( where I live now). To reduce the callories, i woudl use olive oil instead of butter. Would this work? I’m reading regularly your blog but my day job is extremely busy:-( and therefore did not comment in the past months. I’ll make this pie tonight and will let you know how it turns out. Hello! I remember you and am so happy that you’re still following along with the blog. There is no obligation to comment, but of course it’s wonderful that you have today! I’m also very pleased that you’re going to give the pie a go. 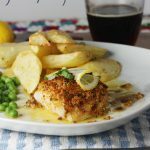 I’ve just made a small change to the recipe as I hadn’t stated that you need to chop the fish into large chunks (although I’m sure that was obvious anyway!). I think it would be fine to use olive oil in the sauce instead of butter. I bet that will give a lovely delicate flavour. I haven’t tried it of course, but I would think using the same amount of oil as butter would work – about 50ml. I haven’t had a good fish pie in ages and now I can make this at home. I’m drooling over the crispy, cheesy topping. Give it a go, Janette! Honestly, I’ve never had fish pie.But is sounds and looks super delicious! Can’t wait to try this one! Hope you do, Mira – you need to get into fish pie, it’s amazing!